Every bunny loves a cake! Looking for a way to celebrate Easter and the beauty of spring? How about a bunny cake?! The kids will love creating this together, and it certainly makes for a fun dessert to share with the family after a big Easter dinner. You can get as crazy as you’d like with this one too. Just let your creative juices flow! Jelly beans, colored icing, or other candies. Two 8” – 9” baking pans. 1. Bake the cake according to instructions. 2. Once the cakes are fully cooled, begin to assemble bunny shape. Leave one cake fully intact. The second round cake will be cut into three pieces. Cut two rounded slices out of the circle, creating a bowtie shape in the middle. You will have two ear shapes on the outsides and a bowtie in the middle. 3. Arrange the pieces on your platter to form the head, ears, and bowtie. 4. Have fun decorating! We fully iced the cake first, then added shredded coconut for texture. The bunny’s cheeks are made from an extra spoonful of icing. (The kids will be dying to eat that piece!) Use the black gel icing to draw eyes, teeth, and whatever else you'd like. Then cover the bowtie in anything yummy – MORE CANDY. Again, this is so fun to do with the kids. They will love calling the decorating shots. It’s as easy as that! 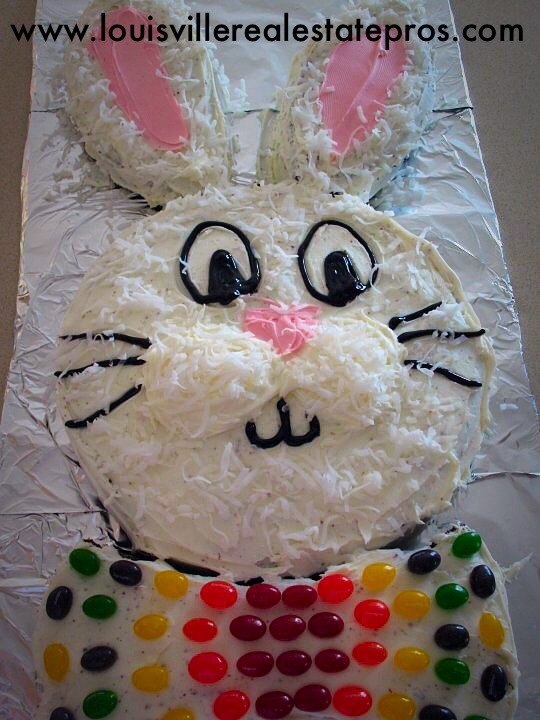 Making a bunny cake can become an Easter time family tradition. It’s one that everyone in the family will surely enjoy. So what are you waiting for? Let’s get baking! Are you searching for a knowledgeable realtor in Louisville, KY? Contact Pam Ruckriegel with The Louisville Real Estate Pros at Keller Williams East. 502-435-5524.